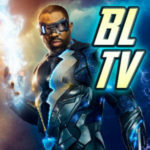 The Episodes: As I made pretty clear when we did our annual Roundtable – Arrow got its groove back. The show returned to its roots and gave Oliver Queen the dual challenge of being Mayor of the city he’s trying to save while moonlighting as the Green Arrow. New recruits came in, but that wasn’t the biggest deal, which would be the coming of a villain called Prometheus whose origins are tied to Oliver’s actions back in Season 1. The actor revealed as Prometheus brought an intensity to his work that made him the show’s scariest foe since Deathstroke. The flashbacks – which are considerably less painful this time – offer the origin of Oliver’s hooded alter ego in a way, but they also finally wrap up to get us to the point the show was at in the pilot. 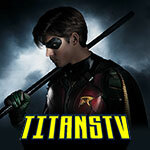 Season 5 also contains the series’ 100th episode which shows Oliver a world where he didn’t get on the Queen’s Gambit to launch this journey. This was the best Arrow season since Season Two and it’s an easy place to jump back in if you’ve dropped off. Picture & Sound: Often times when I review these sets, especially for series that don’t get the Blu-ray treatment, I complain because so much TV looks so bright and vivid that it needs that look. With its darker color palette, yes, seeing Arrow on Blu-ray is a treat, but it’s not as necessary as it would be for, say, Riverdale. So, if you want to spring for Blu-ray, you’ll get a better picture and probably some more extras than the DVD offers, but I think DVD would actually work just as well here. The Extras: This set has a few featurettes and I really appreciate that some of the writers we don’t usually see interviewed are talked to on here. Speed Weed, Beth Schwartz, Brian Ford Sullivan, and Emilio Ortega Aldrich are all represented in addition to Executive Producers Marc Guggenheim and Wendy Mericle. We don’t often hear from them so it’s a treat to “meet” them on these features, in a way. As for those featurettes: There’s the Arrow “Invasion Complex” interview, which is great and talks about the 100th episode; there’s a spotlight on “The New Team Arrow,” the requisite Comic-Con panel, and a featurette on Prometheus. Honestly, the gag reel is mostly made up of people laughing and isn’t particularly laugh out loud funny; it could be I’m just numb to these after seeing so many. I do wish the other chapters of “Invasion!” were represented here, or at the very least a video recap reel was available for those who might not get the sets for The Flash or DC’s Legends of Tomorrow. Otherwise, they’re getting only 1/3 of the story. I understand that including the full episodes might make a set too expensive to produce, but a trailer or recap would be nice. Is It Worth It? For the Arrow fan in your life, definitely. The set has so many extras to keep viewers entertained, and of course, the episodes are top-notch. 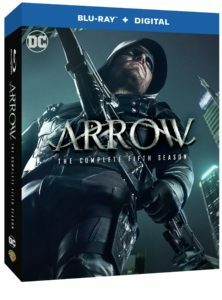 Order your copy of Arrow: The Complete Fifth Season from Amazon.com and support GreenArrowTV!